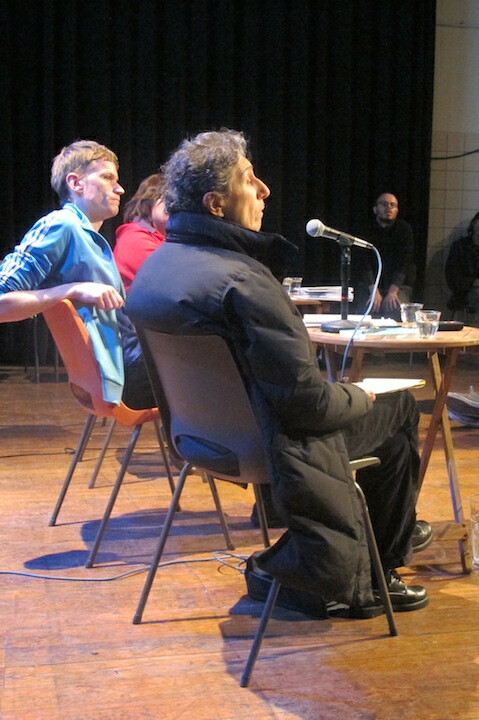 Last year, New York-based activist and philosopher Silvia Federici lead two days of lectures on the commons from 31 January–1 February, organised by Casco – Office for Art, Design and Theory in Utrecht, centred around the ideas raised in her book Revolution at Point Zero: Housework, Reproduction, and Feminist Struggle (2012).1 In introducing Federici and announcing “Composing the Commons” as a motto guiding the coming years’ program at Casco, Casco director Binna Choi mentioned that Federici’s presentation was part of the living research project initiated in 2009 titled the Grand Domestic Revolution (GDR).2 Choi detailed how GDR explores communal ways of working and living involving a wide a range of activities inspired by nineteenth-century Materialist Feminism, a movement that organised cooperative domestic work. Various types of collectives or groups have been engaged in the development of GDR since, she continued, creating a network of collaborations spread throughout different countries. Where the domestic space is conceived of as a “ground zero” for starting change that can apply to a broader social realm and social systems, the commons is at the core of this change. 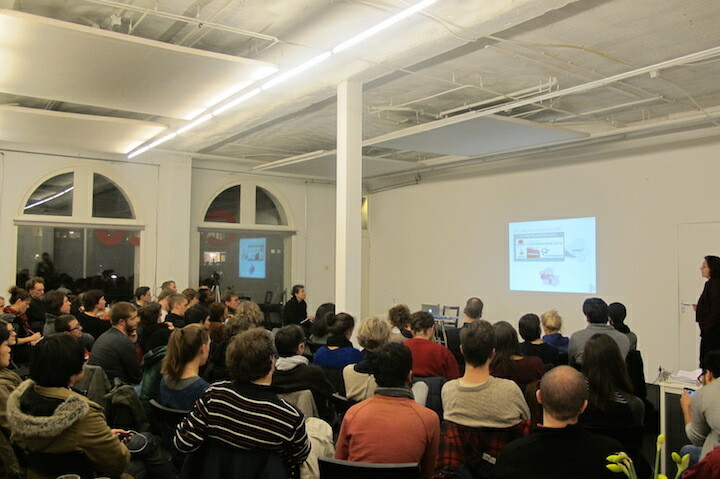 In addition to Federici, on the first day of lectures at Casco contributors included Tine De Moor, an outspoken voice in the Dutch discourse around the commons and director of Institutions of Collective Action and professor at Utrecht University, and initial respondents Dutch artists coalition Platform Beeldende Kunst and artist Elke Uitentuis from Artists Occupy Amsterdam. 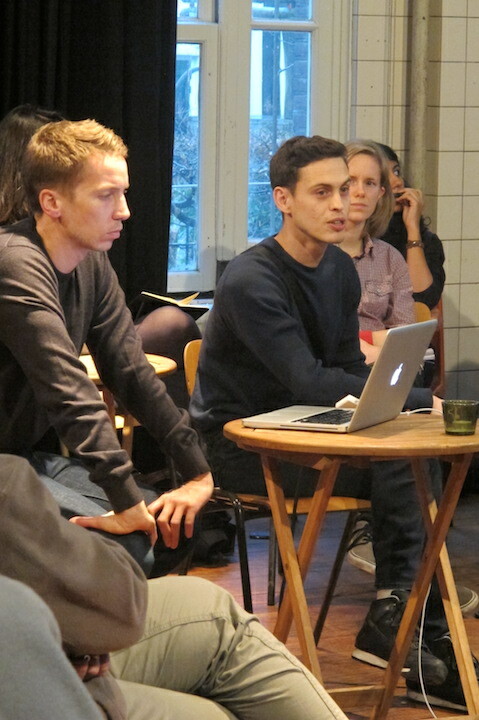 Eluding strict definitions, the commons were then discussed in presentations by Federici and De Moor and subsequent Q&A sessions with the audience. De Moor pinpointed the way in which self-organised groups or so-called private-public partnerships are often market-driven, concluding that commons are not a weapon against privatisation but an alternative which should operate in parallel. 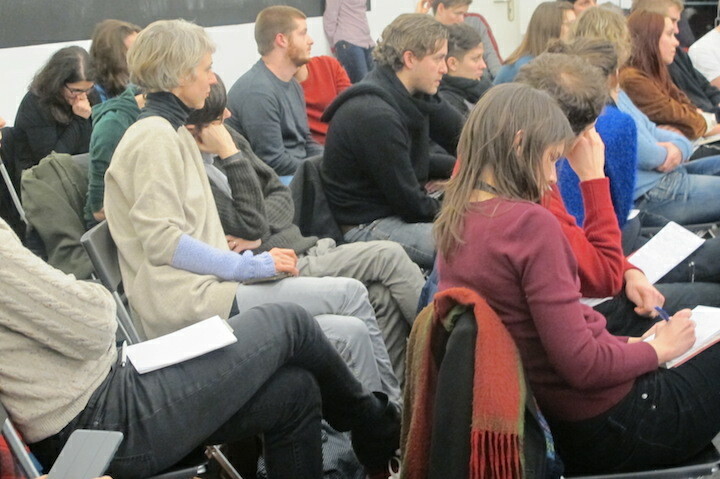 Federici’s position, on the other hand, gravitated towards how the commons – or the practice of commoning – can be a transformative form of reproduction, leading into a discussion wherein the notion of building a commons intrinsically means building a collective subject with the desire to reclaim resources. 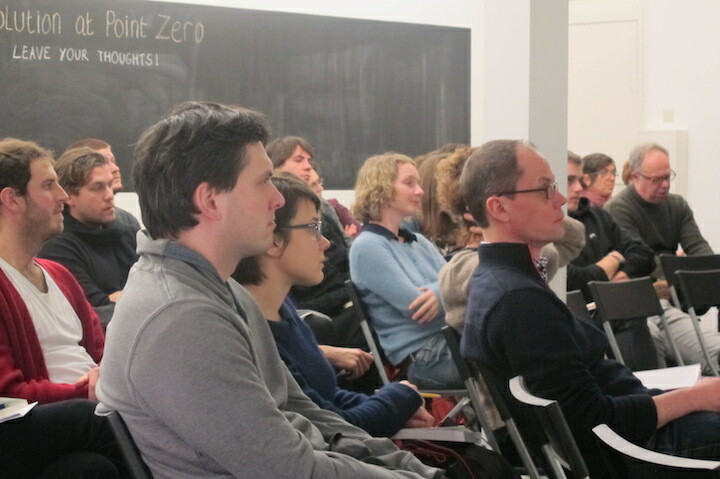 Here follows a condensed and edited report of the conversations on 31 January and 1 February. Federici speaks from her experience within the anti-globalisation movement, the teachers’ and students’ movement, and the feminist movement among others. 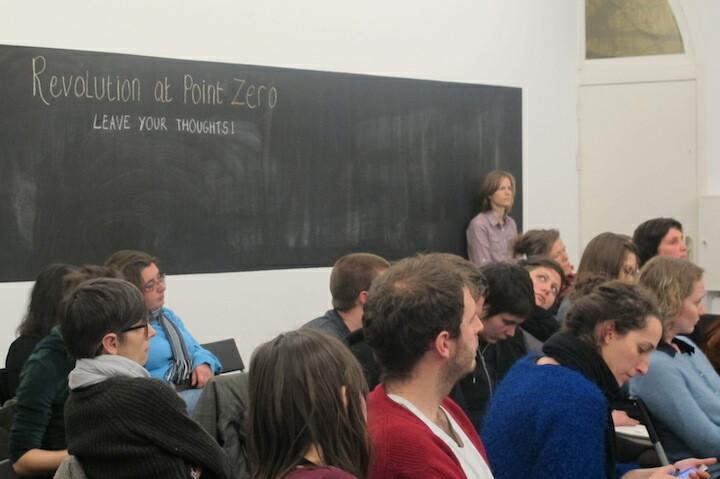 Her essay “Feminism and the Politics of the Common in an Era of Primitive Accumulation”, included in her recently published book, Revolution at Point Zero, has been crucial in defining the commons. In it she paints a loose, working definition of the commons as radical change, not to be considered as things, but rather, as social relations. Comprising many different forms, the commons are a system that has existed for thousands of years. It refers to a broad range of activities where people come together and exercise a communal control over the means of their reproduction – land and other forms of natural as well as social wealth – and in this process, create new forms of cooperation outside the logic of state and market. Federici describes the commons as a system with many historical precedents, but also as a contemporary response to the “point zero” crisis of neoliberalism. Two key elements that characterise the commons are the idea of the alternative (to the state and market) and the concepts of cooperation and solidarity. Federici outlines two different forms of commons: the emerging digital / technological commons (i.e., the Internet as the potential “commoning” of communication, presumably amplifying rather than depleting common resources), and the reproductive commons, insisting that commons are not just assets but primarily social relations. She speaks about the risk that commons be co-opted possibly legitimizing the sweeping privatisation of lands, forests and bodies of water that is taking place on a global scale. We must be aware that neoliberal economists and policymakers are interested in the idea of the commons, and there is a danger that commons may become the means by which capitalism can relaunch itself for another few centuries. While Europe has undergone increased privatisation since the 1980s, De Moor notes that conversely there has been a recent “rediscovery of collectivity” among citizens who on a neighbourhood level address their local needs through collaborative consumption and production. 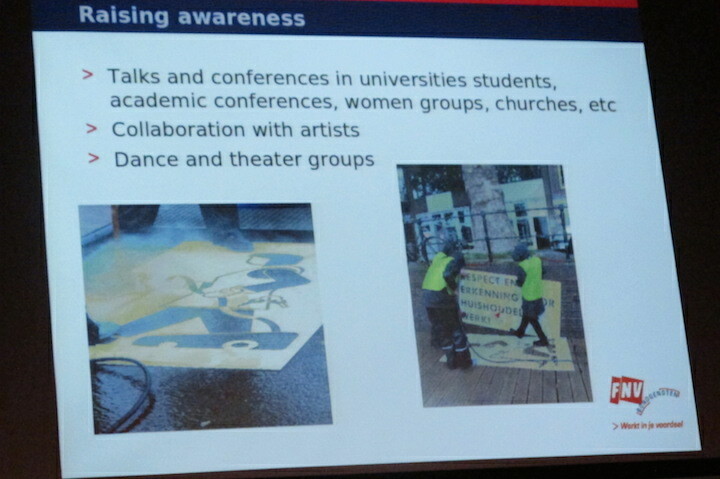 De Moor cites childcare, elderly care, peer-to-peer movements, car-sharing, “share-some-sugar” and Utrecht-based Broodfonds (Bread Funds) as examples of these intra-community endeavours. She goes on to speak of how until the end of the eighteenth century organisations such as commons and guilds were resilient and effective in dealing with crises and internal problems. It was with the Enlightenment, the individualisation of society, the rise of capitalism and the emergence of the nation-state and top-down power that the disappearance of collective organisations was ensured. De Moor relates our contemporary situation to the Middle Ages: once again, the state and market are unable to provide the goods and services demanded by citizens, leading to the emergence of new cooperatives and collective initiatives. De Moor stresses that technology is not always a solution to problems and that introducing technological solutions can even erode community-driven initiatives. She uses the example of a community based around a ditch in the earth from which community members accessed water. Because the ditch was essentially mud, every year the community members joined together to reconstruct and dig out the ditch anew. From this, the community had established its cooperative dynamic: you could take water but you had to help out to monitor and clean the ditch. When an NGO entered and poured in concrete to “solve” the mud problem, the collective relations based on the shared responsibilities and cooperation completely fell apart. P (person from the public): You mentioned this problematic relationship with the government regarding many initiatives for energy and childcare. But I think that artists and cultural producers too take on these initiatives, especially within the city. What I find interesting is your criticism of the public services the government provides. I think this is also the case with artists or cultural producers intervening in the use and design of public space. If they want to do it in a different way from the government, you get these frictions. The (Dutch) government wants to hand over these types of responsibilities, but then it really would need to give much more space. How can we make this work? TDM (Tine De Moor): We have a few projects running right now in our research group, especially on this issue of dealing with the government. We’re trying to identify those frictions, inventory them, in collaboration with the Ministry of Internal Affairs. They really are interested in what frictions there are and what rules can be eliminated to give more room to these initiatives. You have to let them initiate themselves – that’s the basic issue – it’s counterintuitive to leave it up to civil servants; you have to see what happens and let it happen. P: Yes, but it’s a little strange if the government gives away these resources but at the same time forces people to give form to it according to its own agenda. TDM: There are some ideas within the academic world about what is called “polycentricity”. What we know in society today is hierarchy and a top-down implementation of rules, but polycentricity works in a different way; instead of a top-down structure, you work with nodes, with other organisations with similar needs. It’s a new way of thinking about hierarchy; there isn’t a hierarchy but rather there are connections. P: The government also uses these collaborative organisations and initiatives as an excuse to pull back, and that’s also something Silvia Federici said in her talk: that the commons could also become a vehicle for capitalism to relaunch itself. Do you see this danger as well? TDM: Well I’m not sure about that, but I started with the example of Groupon, one of these companies that try to get commercial benefits out of consumer collectivity. They’re falling apart because they thought there was no limit to what they could demand. There are a lot of problems right now with commercial organisations like Groupon: they might say to a hairdresser, “We’ll sell 300 haircuts for you for the next year,” but the local hairdresser says, “We don’t have time to do all of that.” So the collective benefit collapses; it doesn’t work because commercialization kills itself. There was a barrier against commercialisation, and those rules were not implemented or dictated by a government, but they were set by the people themselves. Because they realised that if we don’t stop commercialization, we will lose our collective resources. And that’s the power of the group, the common sense, basically. It’s interesting to see that these were really sustainable institutions because they knew, “if I overuse mine now, as an individual, I will not be able to or my children will not be able to use it in a few years.” There are a lot of arguments to indicate that collectivity might self-correct more easily than the individual; the individual sees short-term, personal benefits rather than long-term advantages. P: How can we dismantle corporate structures for which this doesn’t seem to work? TDM: I often say we have to give these institutions the room to fail, as we’ve given all the other institutions – private, state – the room to fail. A lot of people think this is “a reaction against the crisis”, but I don’t think of this as a common denominator for why we see this in the Netherlands, or Greece; it’s not the crisis but privatisation and insufficient provisions from the state, that’s the common denominator. If it were a reaction to the crisis, it still wouldn’t explain why we see so many commons and other forms of institutions living through all these crises. They didn’t emerge because of the crisis, it was the opposite: their collectivity managed to prevent succumbing to the crisis. I don’t see commons as a weapon against corporations; I see it as an alternative. P: Something I found very interesting in your talk is that the commons that you mostly saw in history is a type of exclusive organisation. I wonder if there could be a type of commons with diversity as a leading force. I would love that and I would go into it immediately. Or the type where the only ones who might be excluded would be those who do not embrace a cooperative system and multiplicity. TDM: There is no consensus within scientific research about the issue of heterogeneity; most groups function because they try to work on the basis of homogeneity. But there are also situations where heterogeneity may be a benefit. For example, people don’t need the same thing at the same age. But there’s no answer in literature whether one or the other works best for collectivity. Historical cooperatives were comprised of large and small, rich and poor farmers. SF (Silvia Federici): Diversity is very important, but we must also make sure that the commons we create are not structured in an hierarchical way. Commons in the past, e.g., on the feudal manors, were not necessarily egalitarian. Today as well there are hierarchies in many existing commons. In Africa, as the land is shrinking, those who have more power within the communal structure are revising the rules deciding who belongs and who doesn’t belong to the commons. For example, in some parts of Africa, women who have entered the community through marriage are being excluded from the commons. Thus some women say, “We don’t want communal land ownership because commons are patriarchal.” So, to answer your first question: diversity is absolutely necessary. Homogeneity is a problem because it creates gated communities. But we must also ensure that communal relations are fully egalitarian. It is also important to recognise that many people view commons only as means for improving our lives; but to me they are means for changing the system. For example, the Occupy movement organised itself as a sort of common. Occupy was a big experiment in communal living, not only in Zuccotti Park, but in the many other places in the US that also had encampments. The time spent together, discussing, holding assemblies, preparing food, making posters, cleaning … was a powerful experience; many of the youth that lived it had their lives transformed. There was a point during the occupation at Zuccotti Park when hundreds of meals were being served everyday: it required a great amount of organisation, a commoning of reproduction and communication on a large scale. At the same time, a split developed between those who saw Occupy as only a means to improve their lives and those who wanted this commoning be the springboard for a more radical transformation. The forms of reproduction that emerged from Occupy were more communal, more cooperative, but did not always look outside of themselves, outside of the community that had come together. Some people, for example, wanted to exclude the homeless, who were attracted to the encampments because they provided a kind of security, a communal life and resources they did not have, like food and tents. So, some would say, “Hey, these people are freeloading.” In some places they called the police when some of the homeless caused problems. Others instead insisted that the collectivity had the power to find other solutions. The question is: What are the commons for? What are the principles that shape their everyday life? There are many communities organising on the basis of homogeneous relations: elderly communities, religious communities. Even real estate agencies are now thinking of constructing compounds for middle class families. But these are not commons that create qualitatively different social relations and transform the world. P: I’m curious about your vision. Tine just said that there is a scientific literature on some of these subjects, but you obviously see something different. You have a sort of vision, it may not be utopian, but still. You said, “We must deconstruct the social structure of present society.” I assume politically and economically as well. Do the commons – in whatever shape or form – take over society completely in your vision? SF: For me the idea of the commons is that of a society built on the principle of solidarity rather than the principle of self-interest and competition. It is a society in which wealth is shared, there is collective decision making, and production is for our wellbeing and not for monetary accumulation. So it would involve a radical change. I would not call it a take over, however. That society is still only on the horizon. But we can begin to create new types of relations. In the US, some groups are experimenting with “accountability structures” to avoid turning to the police when a problem emerges. These are communal structures that work with a person who has behaved in an abusive way. I see this kind of initiative as an example of construction of commons. It is an idea inspired by the example of the indigenous communities in Latin America, where the ultimate sanction is expulsion from the community. SF: If you want to be part of a common you have to follow certain rules that ideally you have contributed to establish. The first rules are solidarity and cooperation with other people. Refusing these principles should be the only condition for exclusion. But when you have refused the principle of cooperation, you have already excluded yourself from the common. SF: Yes, this is true. The groups who are creating accountability structures have done interesting work connecting with grassroots organisations. In a community you have different types of organisations, for instance housing organisations, fighting against rent increases or against foreclosures, or creating urban gardens. The point is to think of them together, to think of how they can support each other and create something more cohesive. We also need commons because in the present economic and political environment it is difficult to win any victory unless we make a struggle that involves the whole community. Working class organisations, in the past, did that, until the 1930s, they organised around healthcare issues, pensions, work accidents. The question for us is how we can connect the different commoning initiatives that are being created. How we can connect the time banks with the urban gardens and / or with the accountability projects I mentioned. I think that by answering this question we begin to address the question of scale. SF: Certainly governments have tried to use and coopt the idea of the commons. (David) Cameron’s Big Society program uses the idea of the commons and community mobilisation to exploit unpaid labour and create forms of voluntarism that enable the government to cut social services. But commons are not a form of unpaid labour. They are the embryos of a cooperative society, as well as a base from which to reclaim resources from the state, because we don’t want to build our commons on the basis of a redistribution of poverty. How do we avoid cooptation? We do it by ensuring that our commoning activities expand our access to the wealth we produce and undermine the divisions that have been built between us. This brings us to the question of the relationship between the common and the public. There is a profound difference between the two. The public is still “private” because we do not control it. I am not suggesting that we should not defend public services from the attack presently waged against them. What I say is that any struggle that we make to defend the public – whether it is public education or public healthcare – should include an element of the common. For example, we need to fight against the privatisation and commercialisation of education, but at the same time we need to build “knowledge commons”, because, the spaces within the institutions in which we can produce knowledge are rapidly shrinking. If we want to produce knowledge, we have to create it ourselves. We still have to defend the public, because the public has the resources we need. But our struggle should open the way to a transformation from the public to the commons. I’ll give you another example: the Water Wars in Bolivia. When the Bolivian government gave the water system of Bolivia to a French company, Suez, the privatisation was so tight that people could be criminalised for collecting rainwater. But indigenous communities, Quechua, Aymara, came together, formed a sort of common, “La Coordinadora”, and were able to push back this privatisation. Then people said, “Why should we stop here and give back the water to the State? Why don’t we develop the social and technical skills that will allow us to control the water from below?” So the struggle against privatisation can have a different horizon than just defending the public. P: This makes me think of a documentary I saw, where a speaker said, “Everybody accepts capitalism not because they think it’s the best, but because it’s the only thing they know.” If you say, “Could another system work?” people say, “No, to decentralise it wouldn’t work.” But how can we know if the only thing we do know is a centralised system? So maybe it’s a matter of a cultural change, of making people understand. SF: Yes, but much has changed in the last 25 years. Many people today have no alternative but to try to create another form of existence, because they are losing all the means they had to reproduce themselves and neither the state nor the market are providing for their reproduction. One problem we face today is the illusion that technology, especially digital technology, can by itself bring new forms of cooperation and even new forms of wealth. We are told that the internet brings people together, and is the only type of ”common” that expands with use instead of being depleted. But the Internet cannot replace face to face contact, and it cannot replace access to land, forests, waters. Moreover, the technology that computers use is an ecological disaster; it uses enormous quantities of water and soil that come from the destruction of lands in many parts of the world, beginning with Africa. 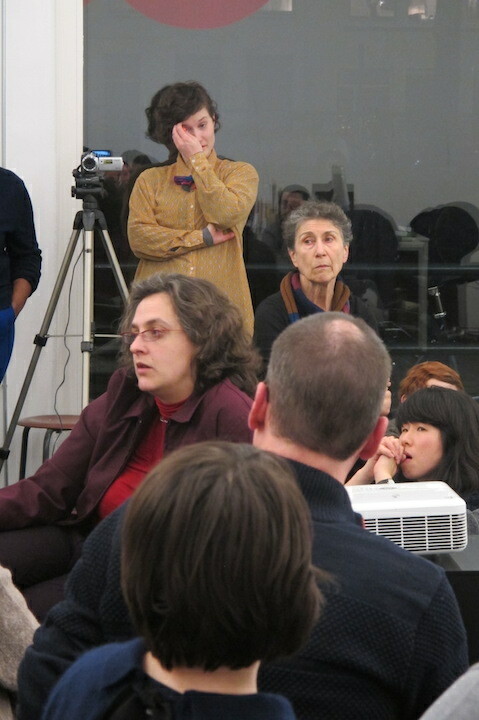 P: Concerning the way people come together, Occupy was confusing as it was such an inclusive movement. Anybody could join at any time and participate in the meetings and express their opinion. People were more inclined to go there because they could participate at any time. At the same time decisions were never made clear, and people started to do things without informing each other, without sharing information and making decisions together. This is something that I have been struggling with. The inclusiveness of the movement was a beautiful thing, and also the multitude that was brought together, but it also created very practical problems. SF: It is a question of taking responsibility. Commons are not just places you take from, they are places where you have to give. In other words, commons are not just about “rights”; they are also about “obligations”. In the case of the (Occupy) assemblies you have obligations to other people, to make sure your intervention is a contribution to the discussion. On this basis, I object to the idea of “global commons”. Clearly our lives can be impacted by what is taking place in other parts of the world. But it does not give us the right to make decisions for these places, when there are people living in them who have been there for generations, and who are immediately affected by what happens in these localities, and are taking care of their environment. They work the land, they care for the forests. They have the right to make the decisions. The principle should be that those who do the work and those who do the caring should have a say. Building a commons is building a collective subject; building a common interest, and undermining the divisions that have been created among us. It is not creating rules of exclusion, but finding ways in which we can begin to tear down the fences between us, not only the material fences but also the social fences. SF: Yes, all these problems emerge: people drop out, people join in, but the Occupy movement is not finished. We see now how important it has been, how many new projects have evolved out of it. Even with all the negativities, conflicts and contradictions, the fact remains that thousands of young people, and also older people, came in contact with a reality that was completely invisible to them. For example, the reality of the homeless, the reality of people in the neighbourhood. They also began to understand what a territory or a square is; what they are socially, what kind of things happen in these places. What are the power relations that traverse them. How our practices shape them. The territory became a source of knowledge, and we began to see in these micro-spaces a whole new social reality. It was a great educational experience, in addition to the educational experience of being together, of speaking, thinking together, body to body, and not through a computer. There were obviously contradictions. In Zuccotti Park, women built a tent which they called a “Safety-tent”, because in the name of commoning, some men would put their hands on their bodies. So they created this space and said, “Here you can come only with our permission.” However, Occupy was a true educational, consciousness raising process. After Occupy assemblies have taken place in different boroughs. There was Occupy Brooklyn, Occupy Staten Island. People have been mobilising against evictions, against rent increases, and out of Occupy has come Strike Debt, an organisation that fights against the debt economy and to ensure that the necessities of life–housing, healthcare, education–are no longer treated as commodities. We have also had Occupy Sandy. Sandy was a storm that flooded a good part of the city, including parts of Manhattan that were in the dark for two weeks. But here the city responded immediately, whereas nothing was done for the coastal areas of the city where poor people lived. These places didn’t see any help for a long time. So the Occupy Movement organised itself to bring them some support. On any given day, for weeks, people went to bring food, clothes, torch lights because the electrical power had been cut off, and to clean the mold out of the buildings. This shows that the hours spent together in the Occupy movement, and the idea of creating something in common, were more than a fire soon spent. There are still working groups, knowledge commons, and, as I already mentioned, there is a new movement called Strike Debt, which came out of Occupy to deal with the problem of debt, especially student debt. Due to the commercialisation of education, now, in the US, every student that graduates has an average of US $30,000 of debt. Presumably after you graduate you get a job and in this way you can pay back your debt, but this is less and less true. People graduate and discover that they don’t get a job, or not one enabling them to pay back their debts, and they begin to default on their payments, and then the interest rates go up, and soon they become indentured servants to a bank or to a collection agency. These agencies call you at night, they call your mother, your employer, your lover, anyone you know. So, for years there was the idea of building a student-teacher movement against the debt, because teachers are involved too. How can you teach students when your class is going to put them in debt? As a teacher you cannot close your eyes to the fact that by taking your course your students are adding another debt to the one they have. But for all the discussions, an anti-student debt movement never got the power to take off. It was during Occupy that people got that power. Talking together they discovered they all had debts, and began to get over the guilt that people feel in this situation, and realise that this is a class issue. And it is not only student debt. People now are using credit cards to pay for healthcare, to buy food. In fact, Strike Debt fights against all these forms of debt. Their principle is that education, healthcare and the necessities of life should not be commercialised and turned into commodities and most importantly, that we should fight not only to abolish the debt but to create a society where you do not have to pay and fall into debt to have an education and healthcare. Their principle is that these debts are illegitimate. Therefore they reject the idea that not paying back your debt is immoral. P: This question is more about the European countries. If we are at “point zero”, what would be the best investment for our time and energy? Should we build commons here? What would prevent the businesses situated in this country from exploiting commons in other countries? SF: You have to begin with yourself. In the 1960s, during the Freedom Rides, black people would tell young whites going down South, “You can’t really help us unless you see your own exploitation, if you’re doing it only for us then there is a problem. But if you recognise that your well-being is also involved, then we begin to communicate, and we communicate on a basis of equality.” I don’t know about the Netherlands, but I see that in Europe as well, everything is being privatised. This is a good place to start from. If you begin to struggle against privatisation at home you will find ways to prevent your country or the EU from exploiting people across the world, as they are doing now. Also keep in mind that you cannot have a good life when a good part of the world is being expropriated from their means of subsistence. You should not assume that you can thrive in a happy island surrounded by a sea of misery. We already see that the kind of “structural adjustment” programs that were used in the 1980s and 1990s to transfer the wealth of Africa and Latin America back to Europe or the US, are now being extended to Greece, Spain, Italy and Ireland. So there is a material basis for international solidarity, and we can be most effective when we can see how the exploitation of other people connects with our everyday life. P: Before you said that the commons is “the embryo of a new society”. So my question is: Can you give a gender to the idea of the commons? SF: Yes, it is primarily women who are “producing commons” today. Because women have been made more responsible toward the reproduction of their families and because the male wage has broken down, women are at the forefront of the production of commons. The family system, the nuclear family based on the wage of the husband and wife, is no longer functioning. More and more in Latin America, Africa and many parts of Asia families are headed by women. And we see the same trend also in the US. At the proletarian level marriage has collapsed and the whole family system is in a great process of restructuring. This is why, women are in the lead forming what I call “reproductive commons”, that is commons providing sustenance, like urban gardens, time banks. Women are carrying on a grand domestic revolution! This is now being acknowledged also by leading male political theorists like Raúl Zibechi who is one of the most prominent radical political theorists in Latin America. In his very powerful work, Territories in Resistance: A Cartography of Latin American Social Movements (2012), which he published with AK Press, he describes the reproduction revolution that is taking place in the region, headed by women, and speaks of “societies in movement”. Men have to join this domestic revolution; this is what we women have been praying for, for a long time! 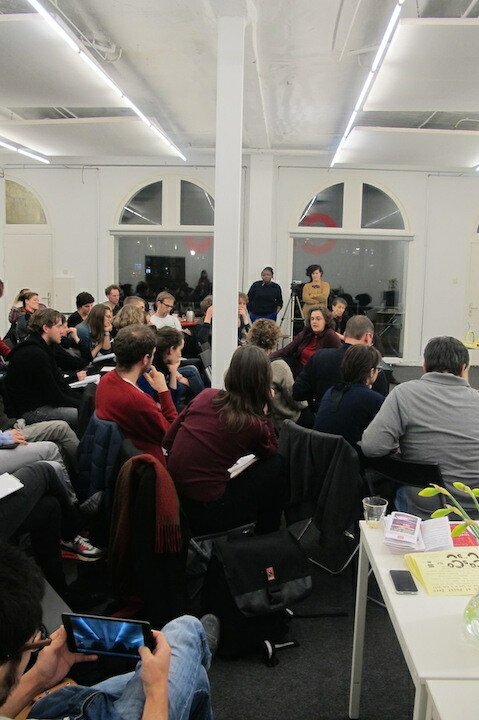 In the ensuing conversation with the public on 1 February at literary foundation Perdu in Amsterdam co-organised with Stefania Azzarello, the Occupy Movement proved an exemplar for how commoning might or might not work depending on the feasibility for an individual to collectivise in an environment that is not always built on such promises. 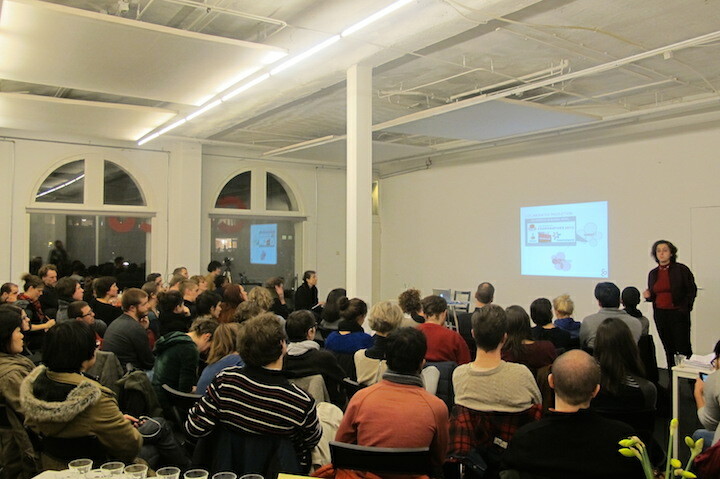 Day two invited collectives that formed under or contributed to GDR (including Our Autonomous Life?, ASK! 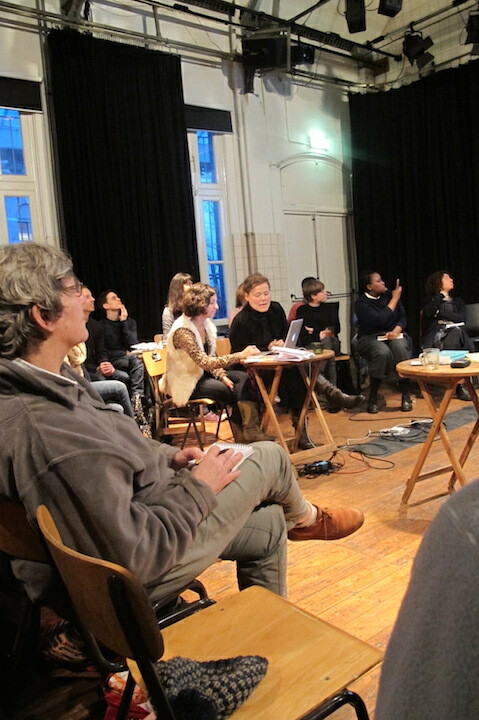 (Actie Schonen Kunsten), Werker Magazine and Read-in) who submitted Federici to gentle interrogation during a closed workshop, seeking tips for collaborative practices. 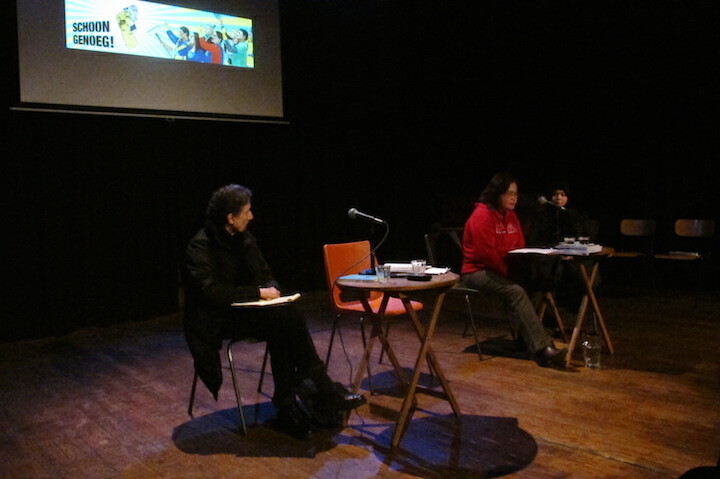 The floor then opened up to involve the Domestic Workers Netherlands, in a discussion moderated by cultural analysis scholar Thijs Witty, used the stage to present their self-organised struggle involving various supporters such as FNV Bondgenoten (a division of the Dutch Trade Union), and collaborators including ASK!. 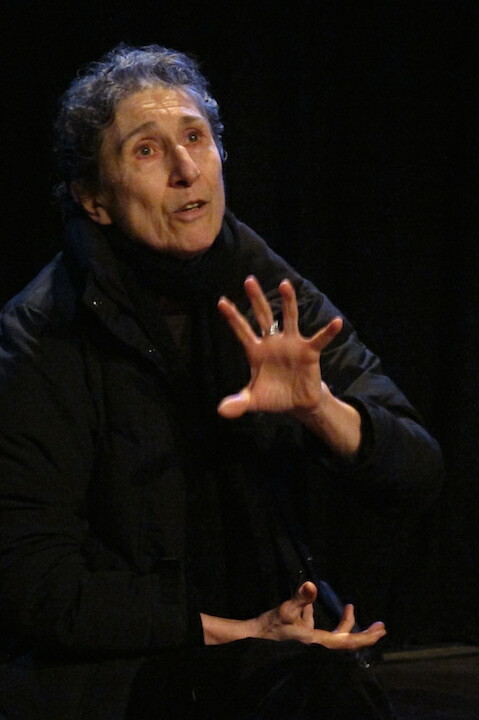 Federici spoke on her campaigning for feminist and worker issues in the 1970s, and the time she could afford to put into it as she worked part-time. It seemed that beyond what commoning could offer us, how we might get involved from whichever perspective we come from, without destroying ourselves, was the crucible for the day. Federici proceeded to reflect on the background experiences that paved the way for the international women’s movement Wages for Housework and discussed the key notions of reproduction, wage and refusal to work. Here follows a transcription of Federici’s lecture and questions from the public. 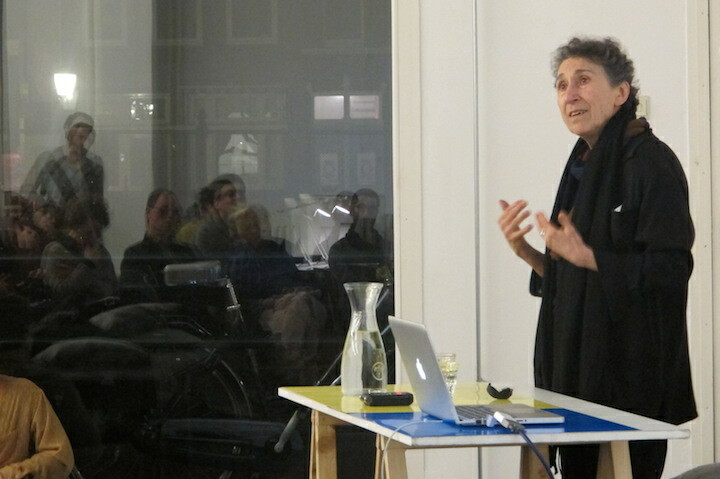 SF (Silvia Federici): The issue of reproduction has been a continuous theme in my political work from the early 1970s to the present. By reproduction I do not mean biological reproduction. Procreation, which I consider a profoundly social act, is part of it, but reproduction is something much broader. In Revolution at Point Zero, you will see that the notion and content of reproduction keeps expanding throughout the book, in correspondence to the different types of movements in which I participated and my different experiences. In the first part of Revolution at Point Zero, reproduction refers primarily to domestic work. The essays in part one come out of the debates that were taking place in the 1970s in the first phase of the women’s movement, precisely around the idea of reproduction and housework. In the second part of the book, my view of reproduction expands, in correspondence to the restructuring of reproductive work in the process of globalisation. The second part of the book examines how the globalisation of the economy, and the new international division of labour that emerged from it, have changed the organisation of reproduction. It discusses the “globalisation of care work” and it goes beyond domestic work, looking, for example, at subsistence farming. It refers to the time I spent in Nigeria, where I learned about the question of land. Coming from Italy, this was an issue that I should have been familiar with, but when I was growing up it seemed that land was an issue of the past. In my youth radical politics revolved around the struggles of factory workers. In the last part of the book I am mostly concerned with the efforts that women in particular are making worldwide to produce communal forms of existence, including reproductive commons, in response to the economic crisis that many of us are experiencing, with different degrees of intensity. Why was reproduction so important in the women’s movement and to me in the 1970s? Ironically, my interest in the question of reproduction, and particularly in the question of domestic work, originated from my efforts to avoid this work. Growing up as a young woman in the post-World War II (WWII) period in Italy, I could see that becoming a housewife would not give me any social power. I learned it watching my mother’s life. When I was a young woman, my desire was to become a man and I did my best to organise my life beyond domestic work. But I have since learned that it is not domestic work as such that is a problem but how it has been constructed in capitalism, because we have to reproduce people so that they become good, disciplined workers, moreover reproductive activities do not entitle us to any form of compensation and force many women to become economically dependent on men, and they are organised in a way that isolates those who perform this work and places a tremendous burden on them. All of this changes drastically the nature of reproductive work, which potentially could be very creative work. An additional factor in generating my aversion to domestic labour, which I shared with many other women of my generation, especially in Italy and Germany, was the experience of WWII. The war was a watershed with regards to the question of reproduction, as I am sure every war is. The experience of my mother and many other women during WWII, which was recounted over and over in the first years of my life, was the experience of seeing the people you love killed, the experience of waking up at night when the bombs are falling. This did not encourage me to bring children into the world. In the US as well – where I emigrated to in 1967 – WWII was a watershed but in a different way. Many women in the US during the war experienced a new type of independence; many were recruited into the war industry and they experienced what it meant to have a wage and to work outside of the home. And this generation of women communicated their desire for a more independent life to their daughters. But the issue of reproduction also became important because we were all aware that confinement to domestic work is the reason why women have less power than men. We realised that though the majority of men are also exploited, nevertheless, they have more social power. So there was a debate in the women’s movement about the connection between being destined – as most of us felt we were – to a life centred on reproductive work, and the fact of having less power than men. The dominant theory among both liberal and socialist feminists, was that gender-based discrimination stemmed from the fact that domestic work is pre-capitalist work, i.e., it does not produce social wealth for the capitalist class, it is a leftover from a pre-capitalistic era, and this is why women, as the subjects of this work, have been disempowered. I was part of an organisation that took a very different position. This organisation, which called itself the International Campaign for Wages for Housework, was shaped by women who came from different political worlds. Some came with some experience of the anti-colonial struggle and, therefore, had a very different perspective on capitalism and power relations; their experience was shaped by a world of people who had worked outside the wage system. There were also women from Italy who had been active in the student movement and the factory struggles of the 1960s, and had been influenced by the rethinking of Marxism that also took place then in the movement Operaismo, which began to rethink the question of labour and wages. Because of these influences, we came to the opposite conclusion from the one presented by the dominant feminist viewpoint. We argued that what we call “domestic labour” or “housework”, far from being irrelevant or marginal to the production of capitalist wealth, is the most important work in the history of capitalism. It is the work that makes the world go round and makes possible every other activity, because it is the work that produces on a day-to-day and on a generational basis, the workforce, labour power, the capacity of people to work. Thus, we saw domestic work as the pillar of the entire capitalist organisation of labour. Our analysis was that the discrimination that women have suffered in capitalist society has nothing to do with the lack of importance of domestic labour to capitalist production, but is rather due to the fact that this work has not been waged. In other words, it is the wagelessness of the woman as domestic worker that has been at the root of her lack of power or at least of her differential relation to power in comparison to men. This insight was extremely productive, because starting from it we began to rethink many questions about life in capitalism. In fact, in the course of our organising we developed not only a different theory on the position of women in capitalist society, but a different conception of capitalism than what you find in Marx. We began to redefine what work is and who the workers are who have kept capitalistic accumulation going. We saw that the wage worker, who in the Marxist Socialist tradition is the revolutionary subject, has been only one of the protagonists of the class struggle. In fact, capitalism has been able to extract a tremendous amount of unpaid labour not only from waged workers but from the unwaged. We realised that capitalism is based on unwaged labour, that wagelessness connects women as domestic workers with a whole world of workers (like workers in a colonial context) who have also worked for no wages. We further realised that the wage is not just an amount of money that pays for work, but a particular way of organising society and dividing people. The fact that men have had wages, and many women have worked as unwaged domestic workers, has instituted a whole relation of female dependence on men, based on this lack of a wage. The wage has also been an instrument for hiding many forms of labour and naturalising exploitation, as in the case of women. It has made housework appear as something natural, something pertaining to the female personality, rather than a specific form of work which is as social, as historically constructed as other forms of work. As I said, this perspective offered a new understanding not only of the social position of women but also of the nature of capitalist society and class struggle, that profoundly altered our understanding of our place in society. Many of the articles contained in the first part of the book are aimed to explain and defend this theory, because the position of Wages for Housework was extremely contested, it was not was embraced by most feminists and certainly not by the left. We were accused of wanting to institutionalise women in the home, because we demanded wages for housework. This for us was a strategy for changing power relations: a strategy for undermining the hierarchies and divisions that we saw in capitalism, built on the power relation between the waged and the wageless. We never assumed that it was an endpoint of our struggle. We saw it as a strategy to change our relation to capital, to the state and to men in a way more favourable to us. This perspective led us to rethink what constitutes class struggle, and many of the slogans that have been popular with the left and the workers’ movement, like the idea of the general strike. We said that there has never been a general strike, because when wage workers went on strike, women continued to work in the home. Another concept we challenged was the concept of refusal of work that in the 1970s was popular among the Italian left. We said, “Refusal of what work?” Domestic work as well? Or do you expect us to keep doing the dishes while you are refusing work? We also saw that refusal of work takes on a different meaning when you are engaged in a process of reproduction and the product is another person. Then you have to think of refusal of work in a different way. We came to the conclusion that reproductive work has a double character: you reproduce human beings, but you also have to produce them as workers for the labour market, which means that you are not free to reproduce them according to their needs and desires. Recognising this dual character of reproductive work has a great political potential. It enables us to see that it is possible to struggle against housework in a way that is not damaging for the people we care for. We can refuse that part of the work that is the work of disciplining people for the labour market. We can struggle to disentangle the activities that reproduced people for their well-being from those that reproduce them as workers subject to the disciplinary requirements of the capitalist organisation of production. We also began to see that there is a whole world of invisible struggles that had never been recognised, because they do not bring women into the streets. For instance, we read the collapse of the birthrate as an expression of women’s struggle to avoid being dependent on men, to avoid being consumed by domestic work. Behind those declining demographic statistics we saw the struggle that women were making to have control over their bodies. By imposing domestic work as unwaged labour capitalism has hidden this work. It has obtained a tremendous amount of unpaid labour and reduced the cost of reproducing workers. It has also created a hierarchical relation between women and men, so that men’s wages can be used to discipline women. Through the wage capitalism has delegated to men the power to command women’s labour and discipline women if they do not perform. This is why wife battering has always been condoned by the state, and sometimes in the past was recommended. Until recently the police turned their heads away when confronted with a man that had beaten his wife. It was understood that battering is a condition of housework; it is a hidden part of the social pact between the state and the wage worker, which includes the disciplining of women and the ability to extract unpaid labour from their daily activities. With that perspective, I began to do the historical work that produced Caliban and the Witch. Women, the Body and Primitive Accumulation, that was published with Autonomedia in 2004, which is the history of the development of capitalism but from the viewpoint of reproduction. I wanted to understand how the sexual division of labour in capitalism has been constructed, and at which point the work of producing human beings and the work of producing commodities had begun to separate. When did the separation of waged and unwaged labour began? When did we begin to see a private / public dichotomy? Returning to the origin of capitalism made me realise that the development of capitalism looks quite different when we examine it from the viewpoint of reproduction, that is, from the viewpoint of the history of women. For instance, I came to the conclusion that the witch hunts of the sixteenth and seventeenth centuries – which took place also in the Netherlands, by the way – were a foundational historical process in the development of modern capitalist society. Through the witch hunt, new forms of social behaviour and a new work discipline were imposed and institutionalised. The perspective we developed in Wages For Housework also helped me in the early 1980s, when I taught in Nigeria, to interpret the political reality that was taking shape in the country and other parts of Africa. I went to Nigeria in the early 1980s, at the time of the beginning of the “debt crisis” and the restructuring of the global economy. I saw in Nigeria the beginning of the processes that we now associate with globalisation, starting with a massive attack on people’s means of reproduction through land privatisation, and the attack on employment and every public service like healthcare, transport, education. In the name of a debt crisis and economic recovery the World Bank imposed a liberalisation of the economy that undermined the most basic means people had to reproduce themselves. Coming from the Wages For Housework perspective, I understood that what we were witnessing was a classic case of what Marx called “primitive accumulation”. That is, it was one of those moments in the history of capitalism when, to cheapen the cost of labour, the capitalist class has to make propertyless millions and millions of workers. It’s no accident that by the 1990s, we began to see massive migratory movements worldwide, from the so-called global south to the north, as many people left their countries seeking an income. My interest in the second part of the book is to understand how this massive attack on people’s means of reproduction has helped reorganise reproductive work. By expropriating people from their land, destroying public employment, cutting public investment in services, not only were millions of people pauperised, but millions were opened up to more intense forms of exploitation. A new organisation of reproduction has emerged from it that has shifted a great amount of reproductive labour, in the metropolitan areas, onto the shoulders of immigrant women coming from different corners of the world. In a number of articles I have written, I have looked at the “new international division of reproductive work” and its social consequences both for immigrant women and for the relationship between women. I have argued that if we want to speak of feminist solidarity, we have to fight against the hierarchies and divisions among women which this new organisation of labour has created. We have to fight against the attack on immigrant women, and we have to join in their struggle against the devaluation of their work and reproductive work in general. I’ve also been keen to stress that although the global reorganisation of reproductive labour has brought many women to work outside their homes and many outside their countries, we should not conclude that unpaid labour has ended. Although much domestic work has gone outside the home, has been commercialised and performed in a socialised manner – the cafeteria, the laundromat, etc. – and although much has been loaded onto the shoulders of immigrant women, most domestic labour is still performed in the home and is still unpaid. More than that: globally, much domestic work has come back into the home, for example, through the informalisation of labour. Today many women do industrial work or textile work at home. The cutting of social services and the reform of hospital care have also brought back a tremendous amount of work into the home, including very specialised work, because families are now expected to take over medical work that was once done by nurses on a clinic basis. The worldwide statistic is that women continue to do most of the unpaid domestic labour in the world. And the fact that this work has been devalued follows women everywhere. 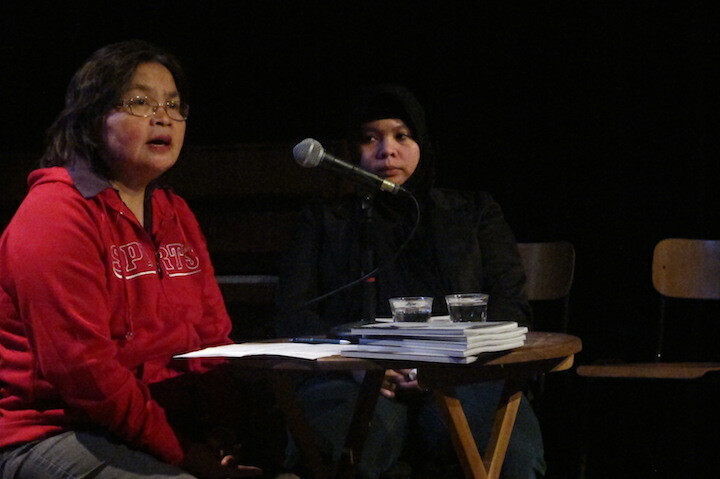 The difficulties paid domestic workers have faced trying to gain better wages and better working conditions are directly connected to the devaluation of domestic labour. We need to reopen the struggle over the question of reproduction, which is a terrain that in the US, at least the feminist movement, abandoned in the 1970s. Much feminist organising has concentrated on gaining access to occupations that were once male occupations and gaining equal pay for comparable work. There has not been an equivalent struggle on the question of reproduction and domestic labour, and there has not been enough support for and alliance with paid domestic workers’ organisations. Yet, across the world, they are the ones who today are carrying on many of the struggles that were initiated by the women’s movement in the 1970s. The conclusion that I come to in the second part of the book is that far from having achieved liberation from domestic work, which was promised by many streams in the women’s movement, today we are experiencing a tremendous crisis of reproduction. Many women live in a state of permanent crisis, having to do so much work, in and out of the home, that they don’t have the time to do anything else with their lives but work and more work. We have to find alternative ways of organising our reproduction, which is one reason why I am so interested in the question of the commons. 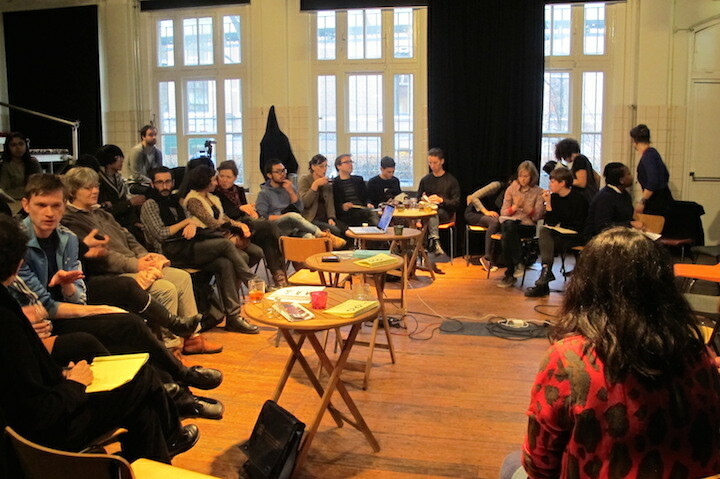 The second day was co-organized with Stefania Azzarello. The transcription was made by Serena Lee, a member of Read-in. 3. Tine De Moor had to leave the discussion early. In this text the voices of Platform Beeldende Kunst and Elke Uitentuis are part of the public. 4. 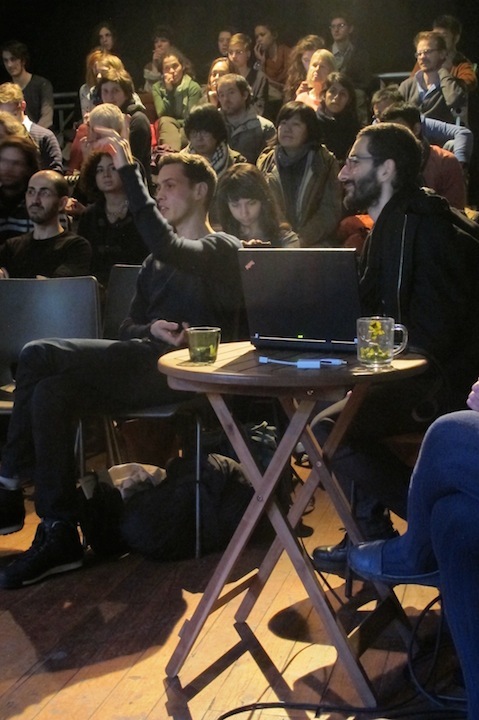 Informally joined together as Artists Occupy Amsterdam. 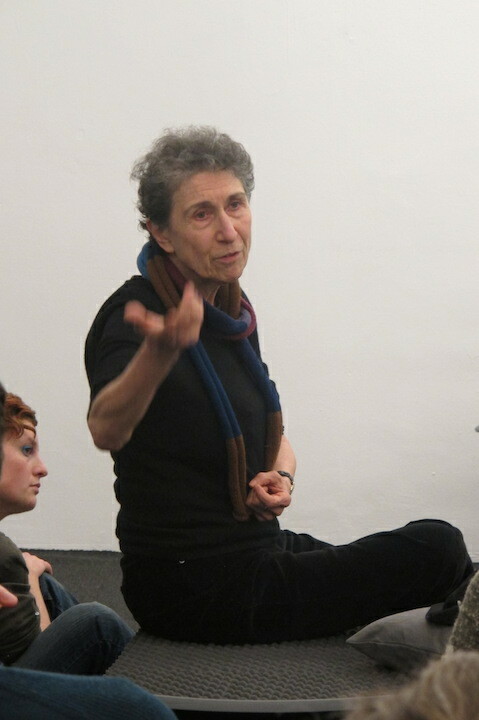 Silvia Federici (1942, based in New York) is a teacher, activist, writer and co-founder of the International Feminist Collective, which initiated the International Wages for Housework campaign in the 1970s. She has authored many essays on political philosophy, feminist theory, cultural studies and education. Federici is Emerita Professor of Political Philosophy and International Studies at Hofstra University, Hempstead, New York. Her published works include: Revolution at Point Zero: Housework, Reproduction, and Feminist Struggle (2012); Caliban and the Witch: Women, the Body and Primitive Accumulation (2004); A Thousand Flowers: Social Struggles Against Structural Adjustment in African Universities (co-editor) (2000); and Enduring Western Civilization: The Construction of Western Civilization and its “Others” (editor) (1995). Tine De Moor (1975, based in Utrecht) is Professor of Institutions for Collective Action in Historical Perspective at the department for social and economic history of Utrecht University. She is (co-)founder of International Journal of the Commons and has been a member of the executive council of the International Association for the Study of the Commons since 2008. De Moor is a member of both the Young Academy of Europe and the Young Academy of The Royal Netherlands Academy of Arts and Sciences. Information about her research can be found at www.collective-action.info.